Those words in the title above were the parting shot from the sales assistant as I exited through Dismaland's gift shop, having dutifully paused to pick up catalogue and t-shirt. Whilst her valedictory message was (I hope) insincere (though I fear those who know me well may say the cap fits perfectly), it summed up the spirit of the faux-misery that Banksy’s Bemusement Park strives to achieve. Outside in the real world shop assistants, waiters, nurses, teachers, indeed anyone who routinely provides a service - heavens, that may even include accountants - will nearly always affix a smile and a pleasantry when serving a client/customer/patient – and very often the smile is sincere. 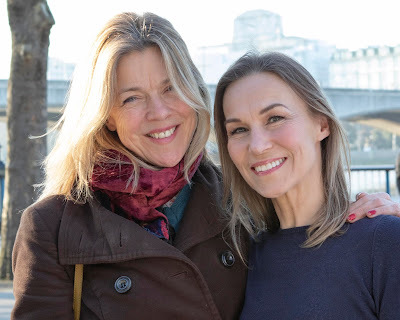 But we all also know so well those occasions when our smiles are glued on and we ease our way through false pleasantries, simply because it is simply an expected common courtesy. 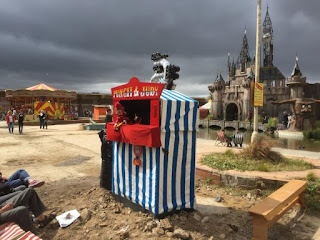 In Dismaland, whilst the jackanapes’ insults may be insincere (cf my above fears of course! ), they are no less glib than the grinning staff member who assists you at Thorpe Park or Disneyworld, maybe at 4pm in the afternoon at the end of a long shift, when he/she doesn’t really want to help you with your baby buggy and trailing brats and just wants to go home exhausted. But he/she glues on the smile regardless, possibly, silently, cursing you. And that is one of the aspects of what Dismaland is all about. Stripping away the hypocrisy of day to day niceties, to reveal an uglier, but not entirely unfamiliar, verite. Much of Dismaland shocks. The centrepiece castle, an imitation of Disneyland’s very own imitation castle is weathered and dilapidated. 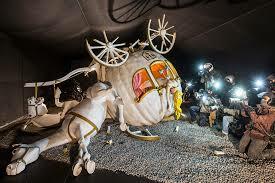 After queuing to enter, the scene is one of Cinderella’s toppled pumpkin carriage, crashed and upended, with the shattered body of a Disney-esque Cinderella, all ball gown, flowing blonde locks and very much cartoon features, lying flung through a carriage window. It’s shocking, but what disturbs even more is that in the pitch black, the crash scene is surrounded by mannequins of real life paparazzi, whose flash guns, strobe-like, illuminate the horror. It’s a short hop of the imagination to Paris’ Pont de l’Alma some 18 years ago – and it is the ghoulish photographers, juxtaposed on to a cartoon scene of fictional fairytale tragedy, that makes Banksy’s work so effective. 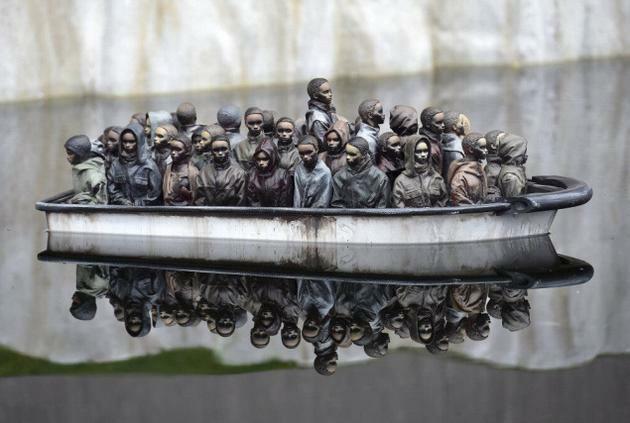 Elsewhere the illusive artist has re-ignited the Tropicana’s mini-motorboat attraction (you know the type – coin in the slot and radio-control a miniature boat on a pond) – but Banksy’s boats are packed with models of desperate Med-crossing migrants, with the Action Man sized bodies of migrant corpses bobbing face down in the water as the boats sail over them. It makes for another troubling tableau – and with several tiny children happily steering their craft (one of the boats is a military gunboat) there was much laughter around the pond. Some of the adults watching (and talking about) the exhibit clearly had an evident compassion for the refugees’ plight that the boats highlight, but for all of Banksy’s noble intentions, is this exhibit leading people to laugh at, rather than care about, the migrants? It’s a moot point and one must suspect that there will be many children (and possibly many ignorant or uncaring parents) who may not grasp the real sea-borne tragedies occurring daily. Has Banksy set these victims up to be laughed at? Discuss. Even if he has, he's only been following a fine seaside tradition. The misogynist Mr Punch has, for generations, been a source of beachside hilarity and kiddie entertainment has he lays into the hapless Judy with a big stick. Banksy updates the macabre classic, inviting Julie Burchill to script this 2015 glimpse into domestic abuse. Oh my, how the kids who sat in front of the Punch and Judy booth laughed as today’s Punch, whose banter had already referenced the monstrous Jimmy Savile, beat his wife, telling the children “you know she likes it really”. Much has been made of the unique nature of Dismaland, but I had a niggling sense of deja-vu, that back on the train to Bristol, I nailed! In their rock opera Tommy, The Who have Uncle Ernie open up the dystopian Tommy's Holiday Camp. 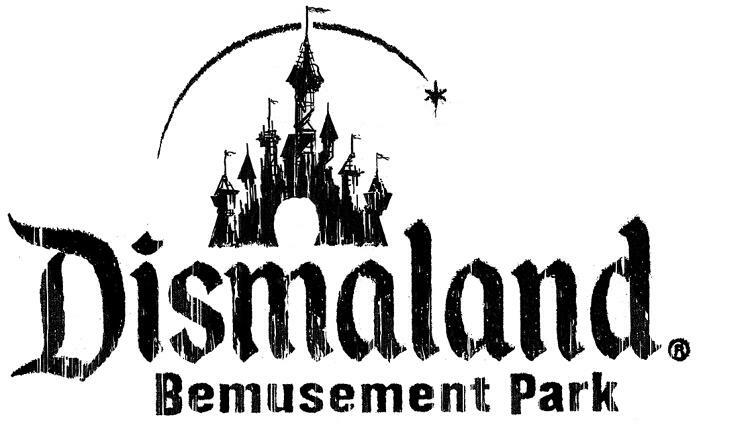 Dismaland is Banksy's version. Banksy is laughing at us all – but thankfully he’s only charging a fiver for the humiliation. 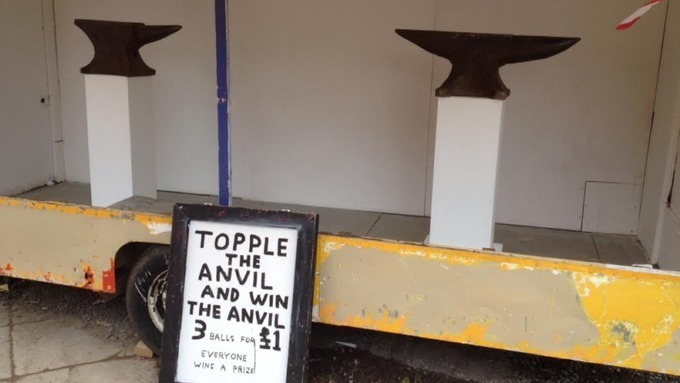 When one fails to topple his anvil there’s a consolation prize instead. It's a wristband with the slogan: Meaningless Rubber Bracelet – which in fact, one week on, has served as a pertinent reminder of the day. 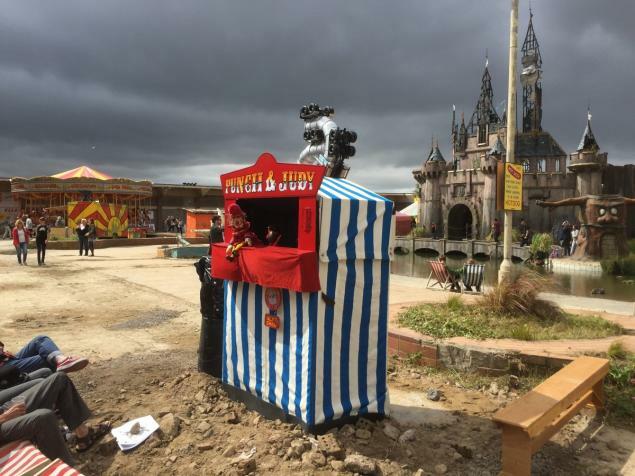 Dismaland bemuses, amuses and hopefully also disturbs. If it doesn’t, there truly is no hope for society. Note: All tickets up until 7th September are sold out. Tickets for 8th – 15th September will go on sale at 10am on Wednesday 2nd of September.